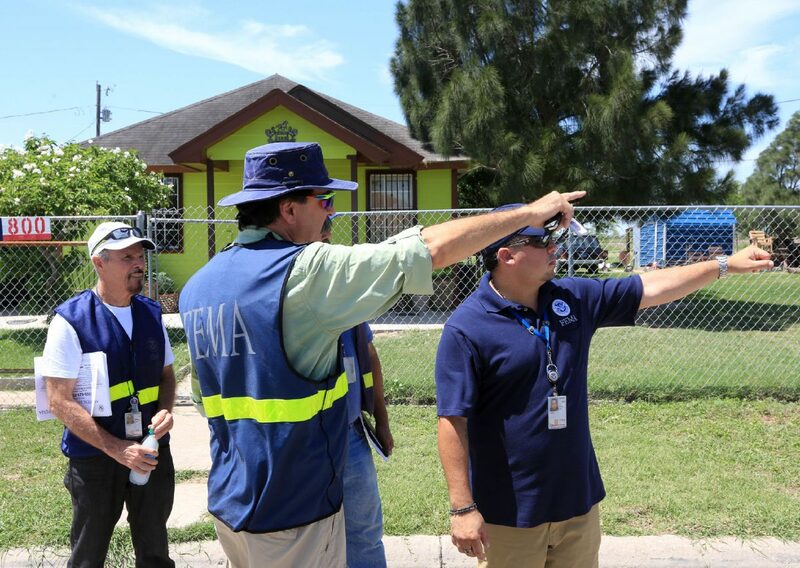 FEMA Distaster Survivor Assistance Specialists Ramon Colon, right, and Michael Taylor, front, discuss which homes still need to have information on flood assistance placed on them Friday, July 13, 2018, in Pharr. PHARR — About 20 residents affected by last month’s rain storms learned on Tuesday how they can get help from the government, as Pharr hosted a disaster relief forum to inform the public of recovery options at their disposal. Only a few questions came from the sparse crowd at the city’s events center, and fortunately, federal assistance is at their disposal. Since President Donald Trump issued a federal disaster declaration earlier this month, Cameron and Hidalgo County residents have the ability to apply for federal aid. The Federal Emergency Management Agency and Small Business Administration presented those options to the crowd. First, the agencies reminded citizens that a disaster recovery center opened in Weslaco on Tuesday. Two more are set to open later in the week, one in Mission and another in McAllen, with another potentially coming to La Feria. FEMA officials told residents to continue rebuilding their own homes, especially if they already began that process. The officials also encouraged everyone to keep receipts of all purchases. Pharr was the third city in Hidalgo County to host such a forum following the flooding and rain across the Rio Grande Valley. Several residents asked about business damages, and how they can recover those losses. Corey Williams from the Small Business Administration said businesses can borrow up to $2 million for real estate, machinery, equipment and inventory. Another question was about citizenship: Does FEMA provide assistance to homeowners who are not United States citizens? Jeremy Schaefer from FEMA said no. However, if there is a U.S. citizen in a home, even if it’s a child, that child can qualify as the citizen of the residence, which will deem the household eligible for FEMA assistance. One citizen also asked about income, and if that impacts FEMA’s decision-making process. The agency does not look at an individual’s income when they apply for assistance.